Vancouver is renowned for its active lifestyle. Various events are sprinkled throughout the year to take advantage of the city’s proximity to great outdoor spaces. The RBC GranFondo Whistler is one such event. Imagine riding a bike for 122-km from Downtown Vancouver to Whistler. The route is filled with breathtaking scenery. However, it is also challenging with steep climbs and thrilling descents. Loosely translated from Italian, gran fondo means “big ride”, and these mass participation cycling events have a long history in Europe and are gaining popularity in North America. This past Saturday, about 5,000 cyclists took part in one of the premier cycling events in North America. Cyclists rode at their own pace, and they took anywhere from roughly three to eight hours to complete the course. A couple of weeks ago I was invited to participate at Art Battle 54. Art Battle? Was that like a visual snub-off where fellow artists paint preposterous pictures of their competitor’s mother? 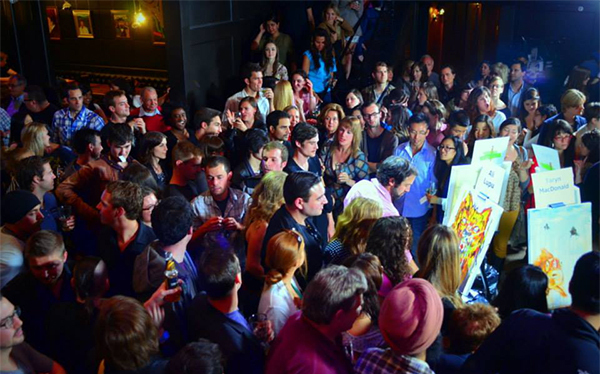 It was billed as a live competitive painting event where painters create the best work they can in 20 minutes. What ever the case, I was eager to find out! Until I heard of Art Battle, I never came across the idea of competitive painting. Painting up until that point was a very private process that was usually spanned the course of days, if not weeks but to have the opportunity to unveil the illusion of art making was very attractive. In Vancouver, it’s easy to take for granted the sheer natural beauty of the city and its surrounding landscape. Having lived in this city for well over 10 years now, I can safely call myself a “Vancouverite”, and I enjoy the privilege of living in the “best place on earth”. But despite the number of years I have inhabited this place, one of the many things about this city that never ceases to amaze me (no, I’m not talking about the rain — perhaps that’s simply the cost of living in this pretty city) is the North Shore Mountains. The natural backdrop they provide against downtown Vancouver is a sight that I can never get tired of. Especially now that I take the number 16 bus to get to VFS Digital Design on a daily basis, I have the pleasure of taking in the captivating mountains set perfectly behind English Bay and Stanley Park as my bus glides along Granville Bridge. In fact, I try my best to seat myself on the right side of the bus just so I can catch the breathtaking panorama everyday (given that the weather isn’t dismal). On Saturday, May 12, VFS Digital Design will host IxDA Vancouver’s Interaction12 Redux: a half-day mini-conference with speakers and discussions about interaction design, industry trends, inspiration, and ideas. As Presenting Partner for the event, VFS welcomes local designers to the VFS Main Theatre for a lineup that includes Scott Nazarian (Frog Design), Mike Kruzeniski (Microsoft), and Ryan Betts (Adobe). The event follows the full Interaction12 conference in Dublin, so if you missed it in February, IxDA’s got your back! We’re working with IxDA as part of our ongoing commitment to support the design community in Vancouver and beyond. For a small group of outstanding Digital Design students, it also means the chance to attend Interaction12 Redux. We’ll have a report from one of them next week, so stay tuned. Want to know more about Interaction12 Redux? Get all the details right here. If you’ve already got tickets, we’ll see you at VFS on Saturday!